Ask me if I like creamy or vinegary dressings and I will almost always choose the latter. So when I saw this recipe from Dannon yogurt I hesitated to try it. Then I decided to modify it and make my own version -- which John LOVES so this is something I will definitely make again. The original recipe called for plain yogurt (Greek yogurt has more protein), no sugar, and the chicken salad would be served over mixed greens (without the cucumber and vinaigrette dressing) -- which you may prefer but, for me, the greens would be too plain and the salad too creamy so it was a good excuse to sprinkle vinegar to balance the richness! 1. In a bowl combine yogurt, tarragon, and mustard. Let stand for 10 minutes. 2. To the yogurt mixture, add chicken, celery, scallions, tomatoes, and seasoning to taste. Let stand for 15-20 minutes. 3. Whisk the olive oil with vinegars. Toss with cucumber and greens. 4. Serve the chicken salad over the mixed greens. 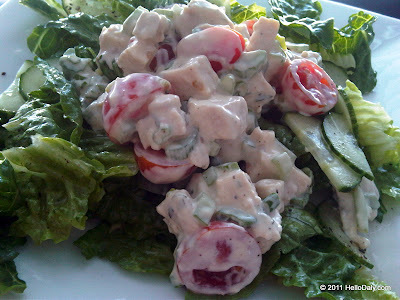 Tomorrow this chicken salad will become a wrap for lunch!